While controversy swirled around like an attacking magpie at the Katherine Street Reserve in Adelaide, the Landmark/RWA shelter stood – solid as a rock. The striking cantilever King shelter installed in the suburban park was surrounded by an array of playground equipment, including in-ground trampolines. Just after the park was completed, some neighbours reported that the trampolines created “extreme volume” when used by larger children. As a result, the council removed the offending bouncy apparatus. 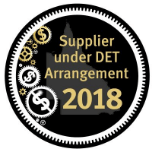 That’s when the “Friends of the Katherine Street Reserve” sprang into action, and through gathering signatures on a petition called “Bring back the bounce”, convinced the council to “backflip” and reinstate the trampolines on the other side of the park away from houses. 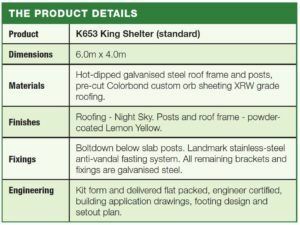 Throughout the campaign, the bright yellow K653 King Shelter supplied by Landmark/RWA was used to display posters promoting the trampoline campaign. The two-post 6m x 4m King shelter is the perfect solution for parents watching their children, allowing unrestricted viewing across the park. It is also a popular choice for skateboard parks. 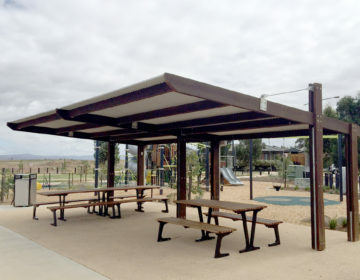 The shelter installed at the Katherine Street Reserve is a standard product, but the King shelter also lends itself to easy modifications, such as adding a Cooldek roof for greater insulation from the heat, or timber infills added to the posts.